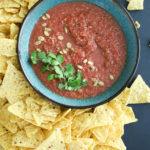 Delicious salsa with a sweet heat and extra texture from pepitas. Perfect for snacking or with dinner over chicken or fish! Add the pepitas, jalapeno chunks, and garlic to a food processor. Pulse a few times to chop the garlic and pepper, then add the rest of the ingredients. Pulse to create a chunky salsa, then taste. Add more salt, honey, or lime juice to your preference. The salsa should be really flavorful! Pulse again until the salsa is the texture you’d like it to be. Top with cilantro and extra pepitas if you’d like, and serve!